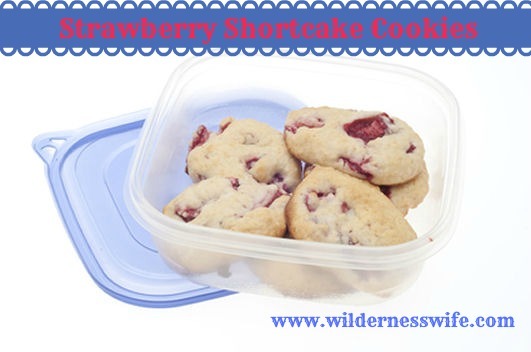 Strawberry Shortcake Cookies – The Portable Alternative! This past weekend ended up a total bust! What had been planned as a Memorial Day picnic at the lakeside turned into a cold rainy weekend in the house. Thank goodness we have a very large front porch (10′ x 30′) that accommodates a large picnic table and gas grill so we could keep the menu that had been planned. And it was kind of fun to change up the original plans to fit the weather. All the things for the menu had been planned with portability in mind. 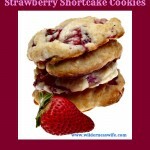 I had made Strawberry Shortcake Cookies, which are great for a picnic when real Strawberry Shortcake isn’t practical. No refrigeration required, no dishes to clean up….it works for me! Portability is the feature I love about these cookies. For a picnic, they are the next best thing to a real Strawberry Shortcake. I think I found this recipe in Martha Stewart magazine or one of her cookbooks. I have made changes here and there over the years. It’s a great one to make snacks for picnics and hikes. These are definitely a Martha Stewart good thing! Sweet and moist, they are a summer treat! With all the ingredients of a Strawberry Shortcake, this recipe gives you a very portable alternative! Combine strawberries and lemon juice in bowl. Add sugar to dry ingredients and thoroughly mix with wire whisk. Using a pastry cutter, cut butter into dry ingredients until mixture resembles course crumbs. Stir in cream till dough starts to come together, then gently add strawberries. Be careful not to over-mix or strawberries can become mushy. You want the strawberries to remain chunky. Drop by the tablespoonful onto a cookie sheet lined with parchment paper. Be sure to use parchment paper. It will make the clean up easier, as the sugary fruit will scorch and stick to the cookie sheet if it comes in direct contact with it. For more great recipes and ideas, check out our Wicked Good Wednesday Blog Party, and link up with us! 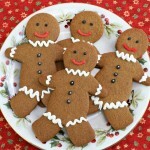 Yum….can’t wait to make these for my Sunday School Jr. High students! Awesome! Coming to you from #EspressosofFaith via #SaturdaySoiree! Blessings! Pinned! Great idea for a cookie – hubby would love this. Thanks for sharing with us a the Home Matters linky party. We hope you join us again! I needed a portable holiday treat to send with my son, who was spending this weekend with friends in their lake house. I ended up creating some Red, white and blue muffins (good enough that the recipe is on my blog) but these would have been perfect also! Pinning for next time! Happy Memorial Day weekend. Glad I found your blog at the Sunday Features Linkup today. 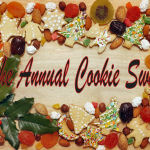 Sheryl, I am featuring these yummy cookies from my month end link party! Deeelishus sounding. I love strawberry shortcake in the spring and summer. This is a great idea for making it portable. Thanks for sharing at What’d You Do This Weekend. Best wishes for tasty dishes this week! These cookies sounds amazing!! Yum! Yum! I love anything with strawberries! Thanks for sharing at Pinworthy Projects. Im a fan of anything “Strawberry Shortcake”! These cookies sound so yummy! What a fantastic idea! These look yummy! Thanks for sharing at Titus 2 Tuesday! Oh how lovely! 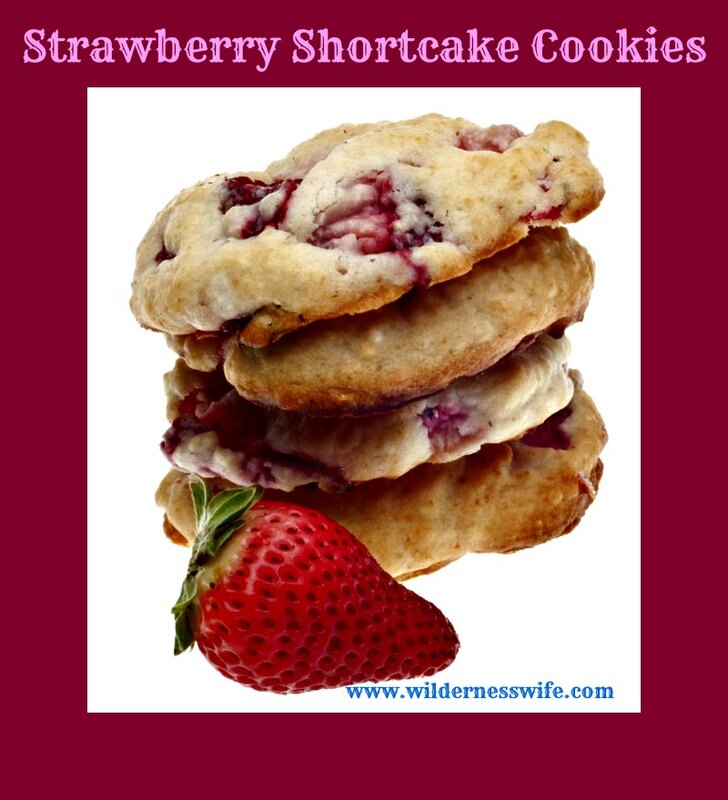 I love strawberry short cake & I’m intrigued by these cookies! Thank you so much for linking up with me this week at Tasty Tuesdays! I’ve pinned this & shared it with my followers! Please be sure to stop back by tomorrow & link up your best “man food” recipes in honor of Father’s Day! I found your recipe on Watch Out Martha ! It sounds wonderful and I can’t wait to try it. The one berry that my husband is not a fan of .. Oh well, guess I’ll have to eat them all! Or you could substitute a berry that he does like….raspberry, blueberry! Be adventuresome…that’s how most new recipes are created – a variation on an old favorite! These cookies look so delicious! Pinned to make soon 🙂 Thnak you for sharing at our ALLMY BLOGGY FRIENDS party ! These look great & who doesn’t love Strawberry Shortcake!! I’m so glad we found your blog!! Thanks for linking up with us at One Sharendipity Place this weekend! These look amazing. I have a blog hop and would love to have you share them there. Hello I am stopping by from Serenity Saturday. 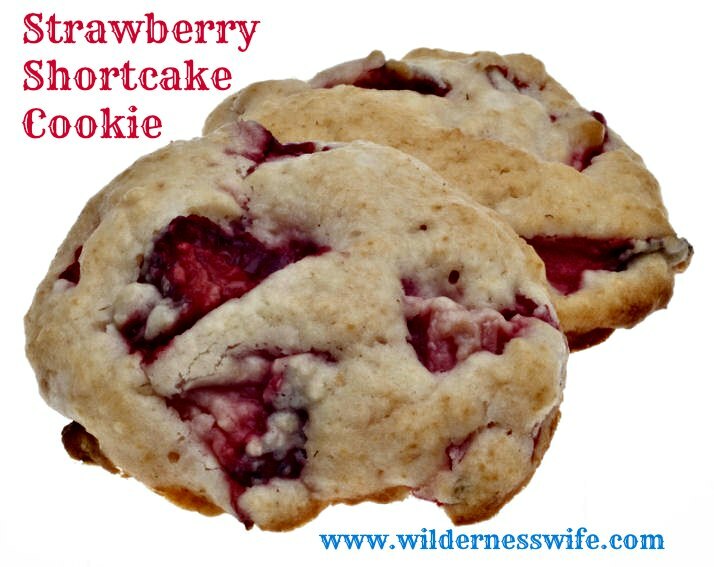 I love the large chunks of strawberries in these cookies. Pinning this! I love strawberry shortcake and cookies. I would have never thought of combining the two. Thanks for sharing the recipe. Now following your blog via facebook! they are pretty, aren’t they! But you should smell them as they cook…just divine and taste…oh so good! Be sure to try them! Visiting from the Family Fun Friday linky party. I’m definitely going to pin these and try them SOON! I’m visiting today from Thursday’s Favorite Things and I LOVE strawberry shortcake cookies!! These cookies are looking great! These look delicious, I’ll have to make these for my grandchildren. Trust me, they are “grand kid approved” here at the Thompson House! These look so good. I love strawberries. They are so good! I love everything strawberry,,,,their flavor, their color, their smell! I have Strawberry potpourri all over the house…the only problem is it makes think about eating strawberries! I would never have thought to put fresh strawberries in a cookie, but these look absolutely delicious. And I like that the ingredients are all relatively healthy, clean ingredients that I feel good about serving my grandkids. Thanks for this recipe. They make a very moist and tasty cookie! These look yummy! We are just coming into strawberry season around our parts and will add this recipe to my collection. Oh wow those sound delicious! Strawberry Shortcake is such a nostalgic american summer dessert and this is a great twist! Yum! 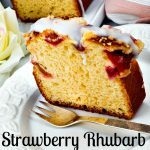 I’ve already may 2 different strawberry lemon baking recipes this spring and this will be added to the list! I love this time of year when strawberries are in abundance. I’ve been collecting strawberry recipes and I pinned yours for my collection. Thank you for partying with us at Fluster’s Creative Muster.